As the population continuously rises and our states urbanize at a high rate, there is no doubt that the FMCG sector will only rise in market capitalization. A company like Patanjali has proven in recent times that the FMCG sector is here to stay and this is just the beginning. The FMCG (fast-moving consumer goods) sector provides goods which every human consumes on a daily basis. As the population continuously rises and our states urbanize at a high rate, there is no doubt that the FMCG sector will only rise in market capitalization. A company like Patanjali has proven in recent times that the FMCG sector is here to stay and that it is just the beginning. In the Union Budget too, the finance minister announced 100% FDI in single-brand retail and awarded retail an industry status. The reduction in the corporate tax for medium, small, or micro enterprises will also boost retail in India in the coming years. The FMCG sector has steadily grown as it was US$31.6bn (Rs20,63,95,40,00,000) in 2011 and went up to US$49bn (Rs32,00,43,50,00,000) in 2016 and is still rising at a constant rate. It is expected to rise even higher at a CAGR (compound annual growth rate) of 20.6% and will reach US$103.7bn (Rs67,73,16,55,00,000) by 2020. 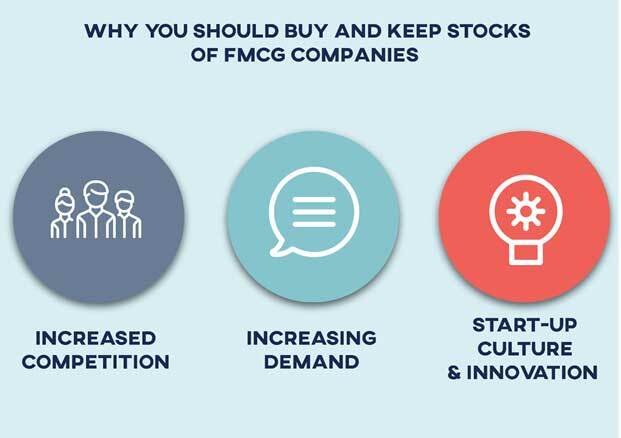 Why should you buy and keep stocks of FMCG companies? 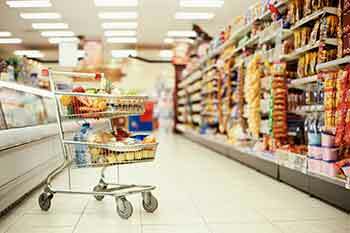 FMCG sector has seen cutthroat competition as many new companies have entered the market with better products. Take the example of Patanjali, it came with the motive of making products that were supposed to be pure ayurvedic, and the people went berserk about them. To keep themselves in the game, other FMCG companies like HUL and Dabur came up with new products made with organic substances. This competition is never-ending and has increased the valuation of the FMCG sector as more and more products are being manufactured on a daily basis. Every company is coming up something better to offer and in the process, has driven the stock prices to rise. If you ask why the FMCG sector is growing at a rate this fast, you shall find the answer in rural India. 60% of the total growth of the FMCG sectors comes from the rural areas. As the government takes measures to make more consumer goods available to the people living in villages, the sector booms further. As long as there is industrialization and the government makes policies to improve rural areas, this sector will keep on growing in valuation, and the stock prices will also increase. On the other hand, if you look at the growth potential of the FMCG sector, you can easily predict that there will always be demand for consumer products no matter what. Having shares of a financially sound and solid FMCG company will let you earn a higher return over time and to do that, you should consider holding your stocks. The main reason for investors being positive about this sector is that it is now providing for innovation which was rarely seen earlier. Start-ups facilitating online services with door-to-door delivery have made the FMCG sector more advanced. FMCG start-ups have realized that the “me too” business and solely relying on investor funding is not enough for long-term success; they are focusing more on technology to solve the problem of market gaps. Moreover, online business and better customer service have become areas of major focus for new FMCG ventures. It has increased healthy competition, and the customers are provided low-cost quality products. These start-ups provide investors with quick exit options as other investors are always looking to buy shares of a good start-up having growth potential. The rate of acquisition and mergers are also high with these new ventures, creating higher chances of extraordinary returns. If you are looking to sell your shares of an FMCG company, you should hold off the sale for some years and should consider buying more FMCG shares, as there is no stopping this sector from growing.